... while European equities shrugged off losses in Asia to advance amid a positive start to the region’s earnings season even as Spanish banks dropped after the nation’s Supreme Court ruled they must pay mortgage-documentation taxes, sending Spanish banking giants Banco Santander and BBVA slumping more than 2%. 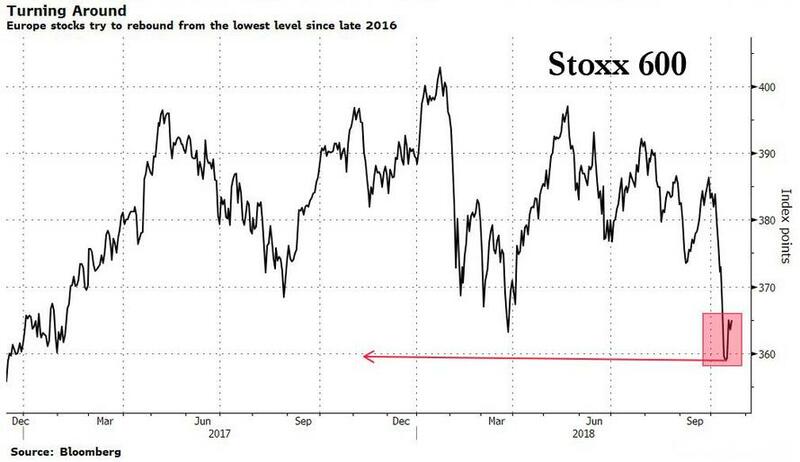 The Stoxx Europe 600 Index rose as much as 0.6% before fading the gain to just 0.2%, led by media stocks and drugmakers. Publicis Groupe jumped as much as 7.1% after announcing plans to sell a U.S. business alongside its third-quarter results. Roche gained 2% after sales beat estimates yesterday, while Novartis climbed as much as 2.2% after raising its 2018 sales guidance and agreeing to buy U.S. drugmaker Endocyte. Meanwhile, tech giant SAP was a big decliner, dropping 3.2% as profit underwhelmed. The FTSE 100 was up 0.2 percent even as Brexit talks between the U.K. and the European Union appeared deadlocked. For now, all European eyes remain are on earnings as investors try to gauge the state of global economic growth. 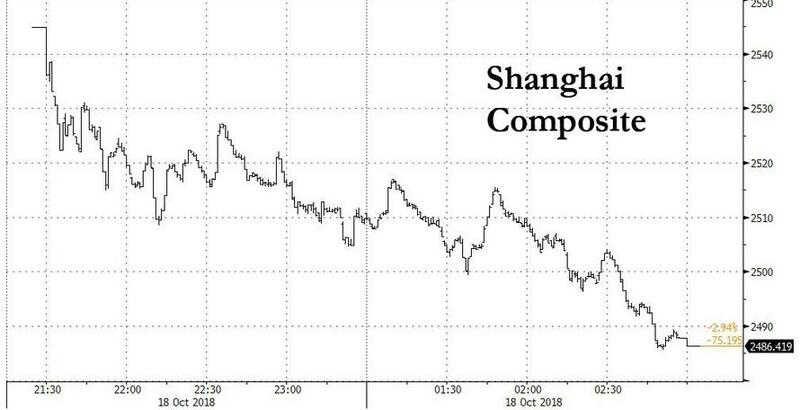 The yuan approached a two-month low after the PBOC fixed the currency unexpectedly lower, some 0.25% lower compared to Tuesday and a fresh 21-month low, spooking traders that currency war is imminent even though the U.S. Treasury refrained from naming China a currency manipulator. The offshore yuan fell as much as 0.2% to 6.9424 per dollar not far off 1-1/2-year low of 6.9587 touched in August. 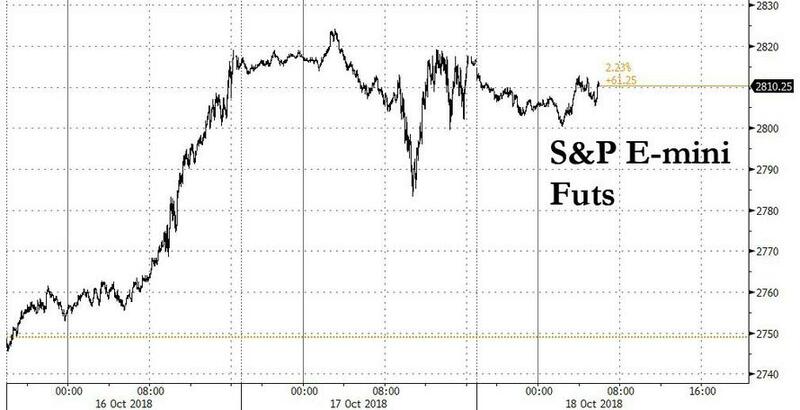 “The US refrained from labeling China a currency manipulator, but dialed up the rhetoric against its currency practices,” said Sue Trinh, Head of Asia FX Strategy, RBC Capital Markets. The 10-year Treasury yield climbed as high as 3.21% after minutes showed Fed officials appeared to favor an eventual move in rates above the level they see as neutral for the economy. Wednesday's Fed minutes left investors with little doubt that rates will keep rising, possibly beyond neutral, three weeks after central bankers signaled their intention to hike before year end. The outlook is testing equity markets again after last week’s sell-off. "Corporates have done incredibly well but it’s clear we are going into monetary tightening in the U.S and that makes people worried about global debt having gone up so much in recent years,” said Peter Lowman, CIO at Investment Quorum, a UK wealth manager. At a time of simmering trade war tensions “people are perhaps taking chips off table and maybe going into cash and short-dated bonds,” he said. Meanwhile, in the latest trade salvo, President Donald Trump announced plans to withdraw the U.S. from a postal treaty that gives Chinese companies discounted shipping rates for small packages sent to American consumers. In currencies, the greenback bounced on Thursday before fading all gains and trading modestly in the red while finding support from emerging-market currencies under pressure as Federal Reserve members debate hiking rates past the neutral level. The BBDXY is up by 0.2% this week; a two-year rate differential between the dollar and its major peers widened to 280bps, the most since 1999, according to Bloomberg data on interest-rate swaps. “The last thing emerging markets, or the US yield curve or equities want is a reminder that US rates are going to keep going up,” Rabobank told clients. The euro changed hands at $1.1518, holding steady versus the greenback, after losing 0.65 percent on Wednesday. The euro has lost just under 3 percent of its value versus the dollar over the last three weeks. 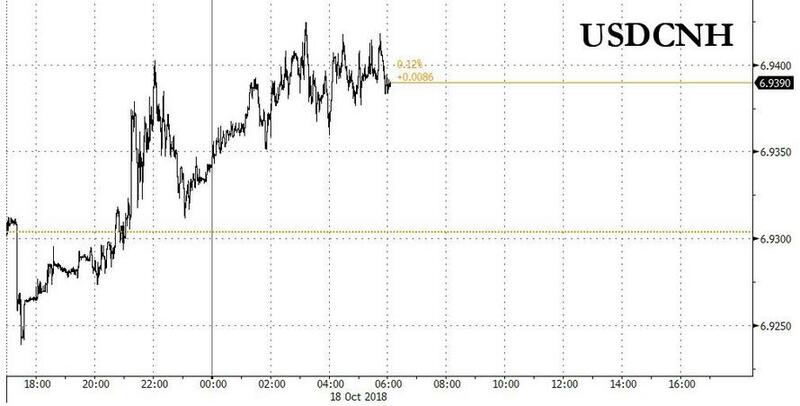 As we noted last night, major currencies showed a limited reaction after the U.S. government late on Wednesday refrained from naming China as a currency manipulator. In commodities, most metals traded lower in London after being hurt by a strengthening dollar and Chinese growth concerns. Emerging-market assets also fell. The British pound reversed losses as U.K. Prime Minister Theresa May said she is weighing a plan that would keep the U.K. bound to European rules for longer. U.S. President Donald Trump is facing increased pressure from Congress over his handling of journalist Jamal Khashoggi’s disappearance, exposing a widening rift between the White House and Capitol Hill over the U.S. relationship with Saudi Arabia. Lawmakers from Trump’s own party, including the president’s ally Senator Lindsey Graham, are openly voicing their discontent and threatening to sanction the Saudi government and threatening to sanction the Saudi government. European equities are mixed as the region failed to benefit from a slew of earnings. Spain’s IBEX (-0.8%) underperforms with banks plumbing the depths as traders cite a ruling by Spain's supreme court as a potential catalyst, while Eurostoxx 50 (-0.7%) is pressured by heavyweights SAP (-2.3%) and Unilever (-1.3%) after Q3 numbers, and the Stoxx 600 (+0.2%) is kept afloat with post-earnings gainers dominating the top of the benchmark. In terms of sectors, healthcare names outperform on the back pharmagiants Novartis (+1.8%) and Roche (+1.7%) with the former raising FY guidance. Meanwhile, while the IT sector pulled back from the prior day’s gains and currently underperforms. Elsewhere, on the back of earnings, Carrefour (+7.6%) leads the gains in the CAC, closely followed by Publicis (+6.4%) which in turn is lifting WPP (+2.5%) in sympathy. In FX, the Dollar gleaned additional momentum from latest Fed minutes that kept a December rate hike firmly on the agenda, as FOMC members noted some data pointing to stronger than anticipated growth and also maintained the view that policy could become restrictive. However, the index has failed to extend recovery gains beyond near term technical resistance around 95.790 and has drifted back towards 95.500. AUD - In contrast, the Aud has rebounded relatively impressively from near 0.7100 lows vs the Usd and just extended post-Aussie jobs data gains towards 0.7150 having lost traction in wake of the rather mixed report overnight (headline employment change missed, but full time offset a drop in temps and the unemployment rate fell, albeit due to lower participation). NZD - The Kiwi has largely tracked its antipodean counterpart, but lagging, as the cross climbs further from recent lows and back into a 1.0850-1.0900 range, and Nzd/Usd continues to hit offers ahead of 0.6600. EUR/CHF - Both around 0.2% firmer vs the Greenback and also clawing back losses, with the single currency reclaiming 1.1500+ status and Franc off 0.9950+ lows. However, Eur/Usd remains weak chart-wise after losing several key supports at 1.1546, 1.1258 and 1.1505, and fundamentally as Italy’s budget remains a bone of EU contention, while option expiries at 1.1500 and 1.1550 (1.2 bn and 1.3 bn) may also factor into the NY cut. EM - The Try continues to outperform and after brief consolidation, the Lira has carved out fresh multi-month peaks vs the Usd near 5.5200. Conversely, the Yuan is back under pressure after a weaker PBoC fix on counter-cyclical factors, and perhaps with tacit permission from the US Treasury after China evaded being labelled as a currency manipulator. In commodities, gold has stayed firm within a USD 5/oz range, tracking USD post-FOMC minutes reinforcing market expectations of slightly tighter US monetary policy. Copper is down nearly 1% amidst a stronger dollar and concerns from Chinese Premier Li that the US trade war is creating additional downward pressure on China’s economy. Elsewhere, iron ore has reached a 7-month high due to Chinese inventories dropping to their lowest level since December 2017. In the energy complex, WTI and Brent are in the red, down by over 0.5% following a larger than expected build in DoE crude inventories, trading below USD 70/bbl and USD 80/bbl. Although this drop may have been somewhat offset by continued tension arising from the missing Saudi Arabia journalist. Looking ahead, we get the latest weekly initial jobless claims and continuing claims along with the September leading index. Away from the data, the Fed's Bullard will be speaking about the US economic outlook. EU leaders will meet for a summit in Brussels to discuss the banking union and strengthening the euro-area’s bailout fund. American Express and Blackstone in the US and Novartis in Europe will be reporting earnings. Yesterday's main course - the September FOMC minutes - wasn’t a game changer but 10yr yields did climb 3.5bps into the close after their release. A number of officials saw the need to hike rates above the long-run level, which was already evident from the dot-plot of FOMC member's projections. Some participants talked about risks associated with a stronger dollar or stresses in emerging markets, but our economists don't think we are yet at levels that would cause a change in the policy path. On inflation, three members now see the risks skewed to the upside and none see the risks as to the downside, although that was before the soft September CPI print, so this may be slightly dated. US Equities mostly ignored the Fed minutes and held their prior moves, with the S&P 500 closing down -0.03%, though a fair bit off the earlier lows of -0.99%. The DOW and NASDAQ also bounced off their intraday lows (of -1.24% and -1.08%, respectively) to close -0.36% and -0.04%. On the positive side, banks led gains (+1.25%) after mostly strong earnings from some mid-cap banks. M&T Bank and US Bancorp both posted lower-than-expected expenses and provisions, though revenues were mixed. Both stocks gained on the session. On the other hand, lower oil prices weighed on the energy and materials sectors (-0.69% and -0.83%, respectively) and weaker US housing data weighed on the homebuilding sector (-2.49%, more color below). Brent crude oil fell -1.38% as the US Department of Energy said that US crude stockpiles rose by 6.5mn barrels over the last week, more than expected and the fourth consecutive weekly build - the longest such stretch in over 18 months. As discussed above Treasuries sold-off, with 10-year yields trading 4bps higher on the day (most after the minutes), while 2-year yields rose 2.5bps to a new decade-high. The dollar rallied +0.57%, its best day in three weeks, putting the brakes on EM currencies, which fell -0.05% for their first loss in five sessions. The euro fell -0.48% and Bund yields declined -3.0bps (before the Treasury selloff) amid modest early risk-off sentiment, while European equities also closed lower, with the STOXX 600 falling -0.40% and the DAX down -0.52%. This morning in Asia, markets are trading in sea of red with some blaming the renewed push higher in yields. The Nikkei (-0.65%), Hang Seng (-0.15%), Shanghai Comp (-1.99%) and Kospi (-0.63%) are all down. After US markets closed last night, the US Treasury released its semiannual FX report, which refrained from naming China as a currency manipulator. However in something new, there was a section dedicated exclusively to China in the Executive Summary - a clear signal from the Treasury that China is the disproportionate focus of the report stating that 'it is is clear that China is not resisting depreciation through intervention as it had in the recent past', but also notes that it is 'deeply disappointed that China continues to refrain from disclosing its foreign exchange intervention'. So a bit of an escalation without being too dramatic. In other markets, Taiwan’s Taiex (-0.27%), Indonesia’s Jakarta Comp (-0.59%) and ASX (-0.05%) are also trading lower. Elsewhere, futures on S&P 500 (-0.39%) are pointing to a weaker start. Overnight, BoJ Governor Kuroda said that the consumer prices excluding fresh food were currently rising at around 1%, compared with the BOJ’s existing view that prices are going up in a 0.5% to 1% range, lowered at the June meeting. This may prompt the BoJ to revise its assessment of price growth upwards at its next meeting. Yield on 10y JGBs has moved up +1.2bps to 0.148% with sovereign yields moving higher in much of Asia tracking the rise in US treasury yields. We’ll see Japan’s September CPI print tomorrow, which may be of interest given the remarks above. In other news, US Secretary of State Michael Pompeo signalled that some sanctions imposed on Turkey over its detainment of the US pastor could be eased now since the pastor has been released while adding that no final decision on the same has been made yet. This helped the Turkish lira to gain as much as 1.79% and extended its daily winning streak to 9 days. On Italy, European Commission Budget Commissioner Gunther Oettinger said "Italy's draft budget for 2019 is not consistent with existing EU obligations," indicating that the European Commission is likely to reject the country's fiscal plan. Oettinger will not be the official to make the decision or lead negotiations, but 10-year BTPs still sold off 9.5bps and the FTSE-MIB dropped -1.33% to underperform the other major European indexes. Separately, German Chancellor Angela Merkel said, without naming any country, that Euro area member states are responsible for their own budgets, have a duty to promote stability, and must stick to rules in the stability pact while adding that ensuring the stability of the euro region and its ability to withstand financial crises is a central goal of the German government. Elsewhere, Italy’s Finance Minister Giovanni Tria said the government will maintain collaborative dialogue with the EU regarding the country’s 2019 budget. On Brexit, German Chancellor Merkel said that “the opportunity to conclude a good, sustainable agreement in a timely fashion remains” while adding Germany “also has begun preparing” for a no-deal Brexit. So a big bid-offer here although there was a headline later saying that she thought the Brexit deal was 90% done. If the 10% is Ireland, final completion could still be a long way off. Elsewhere, French Economy and Finance Minister Bruno Le Maire said that there is hope for a Brexit deal in the “coming weeks” after the UK has made concessions to the Chequers blueprint. Separately, Prime Minister May told Parliament that the "implementation period" might need to extend beyond its December 2020 deadline, through to the end of 2021. This will be difficult to sell to hard-line Brexiteers but something has to give in this highs stakes game. Elsewhere, the UK’s Brexit Secretary Dominic Raab said, in a letter and a six-page memorandum outlining the procedure for the UK parliament vote on Brexit deal, that the vote will be a choice between accepting PM May’s deal or a no-deal Brexit. This didn’t go down well with the backbench lawmakers in the Conservative Party and the opposition Labour Party as it was interpreted as an attempt to undermine Parliamentary authority on not being able to send PM May back to the negotiating table in case parliament rejects her Brexit deal. As for data, the Euro-area’s final September CPI came in line with the flash at +0.5% mom (+2.1% yoy), though they were around 3bps softer on an unrounded basis. EU new car registrations came in at -23.5% yoy (vs. 31.2% yoy in August). In UK, September CPI surprised on the downside at +2.4% yoy (vs. +2.6% yoy expected) while core CPI stood at +1.9% yoy (vs. +2.0% yoy expected) and RPI at +3.3% yoy (vs. +3.5% yoy expected). The biggest drag for CPI came from transport prices, which contributed -30bps mom offset to some extent by clothing and footwear, and energy prices. Elsewhere in the UK, the ONS reported that the August UK house prices rose +3.2% yoy (vs. +3.4% yoy in the previous month) smallest increase since August 2013, while the prices in London fell -0.2% yoy after stagnating for six months. UK home builder Crest Nicholson issued a profit warning and saw shares slump -8.24% illustrating the issues facing the London (and surrounding area’s) property market post Brexit and tax hikes. Good job I didn’t buy at the top of the market last year! Oh wait, I did. Talking of housing, the US starts and permits were soft yesterday and this is one area where the economy is looking slightly less rosy of late. New building permits fell -0.6% mom in September, versus expectations for a 2.0% increase, and MBA mortgage applications declined -7.1% last week, the sharpest fall in over a year. The combination of higher rates and less favorable tax treatment under the new law are combining to weigh on activity, as our economists highlighted earlier this year. Housing starts also dropped -5.3% mom, but this was explainable given hurricane-related disruptions. Today, we get UK's September retail sales, the only release of note in Europe. In the US, we get the latest weekly initial jobless claims and continuing claims along with the September leading index. Away from the data, the Fed's Bullard will be speaking about the US economic outlook. EU leaders will meet for a summit in Brussels to discuss the banking union and strengthening the euro-area’s bailout fund. American Express and Blackstone in the US and Novartis in Europe will be reporting earnings.